These easy-to-finish items allow you to create round ornaments yourself for 3″ and 4″ round designs. I recently got some of the 3″ rounds and used one to finish this Bargello ornament from my stitched-but-unfinished pile. As you can see it’s a very effective finish. The ornaments are available in two sizes, 3″ (BAG28) and 4″ (BAG66). They come in gold or silver. Made of leather, they have several important differences from the luggage tags, also 3″ rounds, and the coasters, 4″ rounds. Unlike the luggage tags, the ornament rounds don’t have a back opening, but a solid leather back. They have an integrated metallic cord hanger and the 3″ one has a matching ribbon bow. For the luggage tag to be an ornament, you need to finish the back and use the ball chain to be the hanger. The luggage tags come in several non-metallic colors and includes a thin piece of acrylic to protect the needlework. I still like to use the luggage tags for ornaments because of the wider color selection. The magnetic coaster also has no leather back, but it is also lacking anything that can act as a hanger. While it does come in many colors and has an acrylic cover, it cannot be used as an ornament.The 4″ ornament also has the acrylic front. While the ornament looks great and is easy-to-finish, the metallic leather is thinner than the colored leather. This has some small implications for finishing. The ornaments because they lack both the acrylic and the luggage tag back,don’t come with a template for cutting your canvas. I pulled off the paper covering the adhesive and used that as a template. If you have a 3″ round template of some sort, it could also be used. 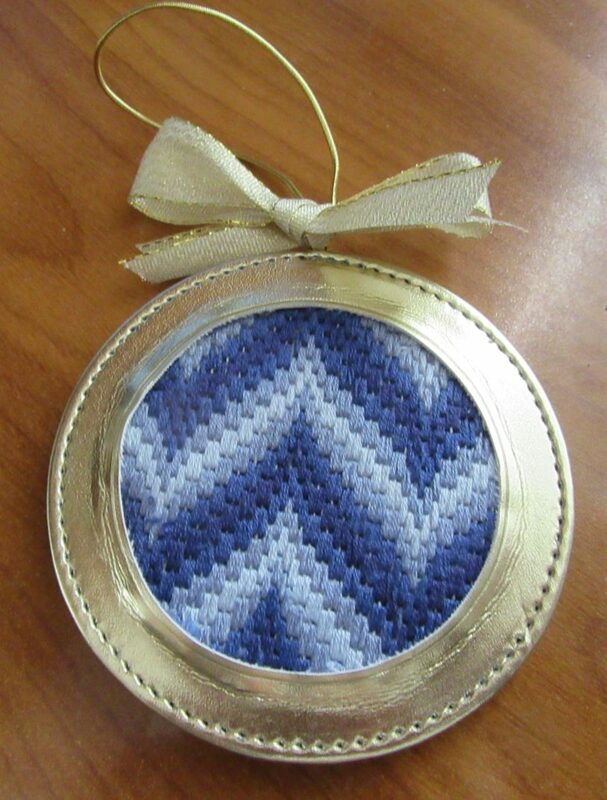 Before placing the needlepoint on the ornament, I loosen the edge all around by lifting it slightly. Place the needlepoint, centered and in the proper orientation onto the uncovered opening. Starting at the top, lift the leather edge and insert the canvas under it. Do this as you work your way around the edge. When you get back near the beginning, it becomes more difficult to insert the edge of the needlepoint under. You may have to trim your piece slightly. Once the needlework is completely inserted, brush off or cut any stray threads. The edge will be wrinkled and raised a bit. Weight it under a heavy book overnight to lessen this. It won’t go completely away, but in time, the leather will relax. That’s it, your finished ornament is ready to go! Right now many shops are featuring self-finishing items. It’s a perfect time to pick up some to createthose last minute gifts. I love these and am looking forward to using them to make more of my projects go out into the world!